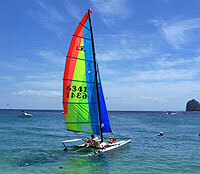 Hobie Cat Rentals, Cabo San Lucas - Save Here! A great hour or two of total relaxation in Cabo San Lucas, gently sailing and lounging in the sun on the Sea of Cortez, enjoying great photo opportunities of The Arch, Land's End, Medano Beach, and the Cabo San Lucas Marina, among others. You'll get to sail your own private 2-person catamaran, just your group and your professional guide, then you can return to the beach and lounge, eat lunch, or enjoy one of our fun beach breaks at Blue Marlin Ibiza or The Medano Beach Club. Your guide can show you how to sail, or can do the work while you relax and take in the sun! If you would like to enjoy snorkeling at Pelican Rock during your Hobie sailing experience, you'll want to check out our Private Catamaran Snorkeling. Cruise Passengers: Yes! This excursion is available to you and will work with most cruise schedules. We will adjust the start time to work for you. Water Taxi from the marina to the beach club is provided for $5.00 per person round-trip, paid in cash when you board the boat. Daily starting at 1:00 PM, you will need to book a time in advance, so that we're sure to have it available for you and not rented to somebody else. Nikki Beach in front of the Melia Cabo San Lucas hotel. Price is total cost, per hour for up to 4 people, not per person. If you're on a cruise ship, consider combining this tour with one of our Beach Breaks! If you book a beach break, you'll get free round-trip transportation, then you can Hobie, snorkel, take great photos, then come back and relax on the beach with food and drinks!